2016 – New Look, Site Cleanup, More Music, Thank you! Hello dear friends, followers, supporters and visitors to my website. I have let this site slip into a bit of a stagnant mess over the past couple years. I am now in the process of revamping, updating and trying to make it better visually and functionally. I plan to make occasional blog posts, with the primary focus on my private event business (Wedding DJ, Event Coordinator, Catering Rental), Event Services (Sound, Lighting, Video, A/V rental) And my music production (Yes, I still have an album in the works). Event updates will be posted on the Electric Vardo Website approximately monthly. E-mailers will resume to approximately monthly as well to include all public activities by me, Electric Vardo and Underground Nomads. Underground Nomads updates are posted weekly at undergroundnomads.com. First and foremost, I want to thank you for your support over the years. I never imagined that I would actually be able to live my dreams and call it my career. It is not the easiest thing to do from a financial perspective, but it is truly rewarding. Life is a fun balancing act :). I just came across this Article from 10 years ago that Teed Rockwell wrote for India Currents, during my early days as a DJ and event producer. It got me reminiscing and thinking about all that has happened in my life since then. It has been truly amazing. I’m in a relationship And creative partnership with an amazing human being. My friends are my colleagues. I went from playing music to making music. I have had opportunities to collaborate with some amazing artists. This has all been possible due to the tremendous support of my fans (it feels weird to say fans. “I have fans, Yay!”), friends, family and partner. I am looking forward to participating in some great upcoming events this year and sharing music with you. I will be posting the upcoming Event Calendar at electricwardo.com. Check there or sign up for my e-mail list to keep updated with events that I am involved in or recommend. On this site, the right column will feature links to my facebook page, twitter feed, soundcloud music page and more. Happy New Year. It’s looking great already. Dance Performances curated by Gina Grandi. DJ SET FOLLOWING FOR THE REST OF THE NIGHT. Drink Specials + Happy Hour each week! September brings exciting performances by residents FatChanceBellyDance, Verbatim and more, plus very Special Guest music producers and DJs from Austria and Japan, Dunkelbundtand Makyo. FATHER + SON Special Night! + FatChanceBellyDance, Shanti Jourdan (Los Angeles), Surreyya Hada. Post-Reverence weekend party: Free Entry before 10pm with Reverence ticket. 2-for-1 until 11. Dance Performances by Calamity Sam, Tatyana, Mohini, Azure. $5-10 sliding scale cover for this night. The night begins at 8PM with a special Live set by Makyo’s band. Note that schedules each month may change. Check the website undergroundnomads.com or Facebook page for the latest information regarding DJs and Dancers performing each week. F8 ° San Francisco ° Food. Art. Music. 1192 Folsom St. (@ 8th, next to Cat Club), SF. *Come early so you don’t miss the awesome dance performances and Happy Hour! Help us spread the word about our new night to your friends online and in real life :). We truly appreciate your support. LIKE Our Facebook Page and RSVP to receive 2-for-1 cover before 11pm. Mention the 2-for-1 Summer Special at the door. NOTE that F8 will be open for Happy Hour, so you can come even before 9 and hang out, enjoy some drink specials and appetisers. We start charging at 9:30, so if you are in early, you can stay for free (of course, we don’t mind the support, so you are free to contribute). Non Stop Bhangra (Date Changes) Sept. 14, Oct. 19, Nov. 16. As always, the night will begin with the ritual Bhangra dance lesson followed by beautiful dance performances with Dholrhythms Dance Company. To round out the mix, Special Guest DJs join the decks with Non Stop Bhangra’s own DJ Jimmy Love and DJ Rav-E, with NSB dholis Pavit and Mehul rocking the drum beats. Beyond dance, Non Stop Bhangra caters to sight and sound with visuals all night by DJ Amar while NSB photographer Odell Hussey captures the experience. So come join the crew for another colorful and vibrant night with great music, friends, gratitude, happy vibes, and non stop dancing.Note the date changes for the rest of the year. Non Stop Bhangra normally falls on the 2nd Saturday of the month, but due to some changes at the venue, NSB has been bumped to different weeks for the remainer of the year. We will likely resume 2nd Saturdays in 2014. Check nonstopbhangra.com for the latest. Unmata / Hot Pot I.T.S. Bay Area classes with Calamity Sam … Current Session in Progress, Drop-ins welcome. Calamity Sam is now the Exclusive Bay Area certified instructor of Unmata / Hot Pot Improvizational style Belly Dance classes, and is teaching in Oakland/Emeryville on Monday Nights. She just completed the first 2 of the ongoing 8 week sessions, and the next one begins on August 12th. Level 2 and 3 classes coming soon. The ELECTRIC VARDO lineup (Friday night) will feature Dan Cantrell on accordion, Susanah Goldenstein (aka SooozhyQ) on doumbec, Karolina Lux on trumpet, Elizabeth Strong on zills and Jef Stott on oud with DJ Amar and Dulce Vita rockin the decks global style, joined b ydancers Calamity Sam, UNMATA, Elizabeth Strong and Karolina Lux. Join us for another night of TMI (Total Madness Improv) Belly Dance, an all-improv fusion belly dance show with music mixed by DJ Amar. It’s a Party and a Show at Donavon’s homey studio in Eagle Rock. Bring a snack or drink for our potluck table, enjoy some wacky and great performances by some of LA’s most respected dancers sharing the stage with up and coming performers making their stage debuts in a fun, low key environment. Folks from out of town who want to watch, we will be streaming live at http://www.ustream.tv/channel/Iqaat Check out our last show here: http://www.ustream.tv/recorded/19422248. A celebration of musical roots with an organic fusion of past and future, Eastern and Western, modern and traditional. Where live electronic musicianship, interactive digital art, luscious visuals, Tribal fusion belly dance performances, inspired workshops and world infused music inspire you to dance and engage in creative convergence with our vibrant community of artists, musician-inventors and trans-cultural luminaries. Worldly DJs Janaka Selekta, Cheb i Sabbah, DJ Sep and Amar with The Lady Fred & The Black Heart Ballads, join the Lovetech controllerist crew & guests Rich DDT, Moldover, Henry Strange, Biomimicrant, Minimasher, Pulse of the City & more in 2 rooms at The Center SF – 548 Fillmore St. (@ Oak) in SF’s Lower Haight. 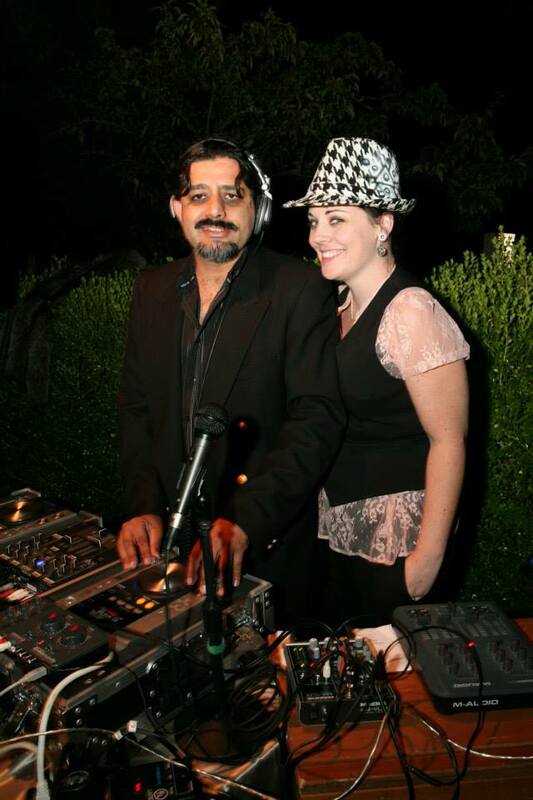 Come join us for the 2nd Taverna Nights, hosted by Tatyana Balte & Calamity Sam. After a greatly successful debut show last month with guests Dusty Paik and Laura Elisabeth, they’re back with a new lineup this month featuring Gibson Pearl, Lisa Hyde and Danielle Lottridge, in addition to your hosts, with music support by DJ Amar. 10pm, Upstairs at Belden Taverna in SF. Cover is $10-15 sliding scale. Come celebrate the birth of American Tribal Style Belly Dance, right down the street from the FCBD studio in SF, where it all started 25 years ago. This is both a party and show, so come hang out with us, have some drinks with us, and watch some performances by FatChanceBellyDance and Special Guests Wendy Martlatt and Malia DeFelice. There will be some dancefloor time for those who wish to hit the dancefloor, with DJ Amar. Tickets are on sale now. Limited reserved seating. A special night to both celebrate old times and give Chebiji some more support toward his cancer treatment, Join DJ CHEB i SABBAH himself, joined by JANAKA SELEKTA & DJ AMAR for a night reminiscent of the Nickie’s days. Nickie’s regular Shabi Farooq will be joining us on the mic and tabla. Rockabelly and Calamity Sam will open the night with dance performances, followed by dancefloor beats by DJ Amar, Cheb i Sabbah and Janaka Selekta. A yoga open house with four of the Bay Area’s up-and-coming yoga teachers. Stay for music, mingling and munchies. 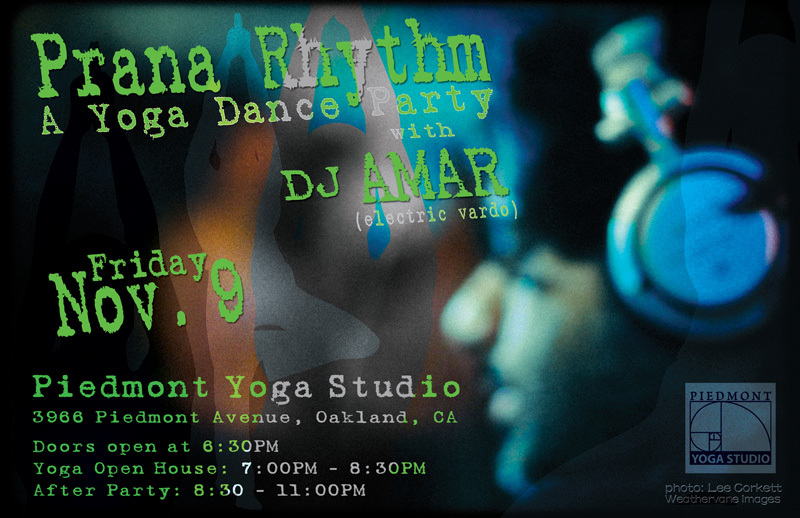 Doors 6:30pm, Yoga open house: 7:00pm, After Party 8:30 – 11:00pm with DJ Amar. As we wind down 2012 before heading into hibernation for December, we invite you to come celebrate the festival of lights with the Non Stop Bhangra crew for our last NSB event of the year. Diwali is known not only for the illumination of lights, but also as a time to reflect upon and celebrate the good fortune and relationships of the passing year while spreading positive energy for the coming year. What better way to celebrate such an auspicious and beautiful occasion than to share a dance or two or three with the beautiful people on the NSB dance floor. So bring a light, your smile and your most vibrant, colorful style and get down with Non Stop Bhangra one last time this year! DUB MISSION presents an exclusive Bay Area appearance! featuring dr. ISRAEL (vocals, sound system and live remixing and CLIFF TUNE on drums Record Release Party for GHETTO DEFENDANT: REMIXES plus DJ SEP (Dub Mission) at Elbo Room – 647 Valencia Street, San Francisco, CA 94110. On this night dr. Israel will be playing with live drummer Cliff Tune (Con Brio & Artemis). He’ll be performing live versions from his newly remixed Ghetto defendant EP, (whose release we’ll be celebrating) along with a selection of his original hit tunes of classic dancehall, roots reggae, dub and dubstep in a special high energy sound system show. Travels abound for Sam and Amar. This time it’s a road trip to the beautiful Northwest. Our first stop is Boi … wait, not so fast … This Weekend is the Non Stop Bhangra Global Massive with Surya Dub taking over the loft for a Tropical Bass spectacular. Nearing the end of the month, we head to Boise for our favorite festival in the world, Fusion Fest. Sam will be teaching and performing, and i’ll be DJing the AfterParty. After Fusion Fest, we head west for some time off in Portland and Bellingham before we hit Tacoma on the 4th for Cirque De Bijoux and Seattle on the 5th for Djinn & Tonic with Kristine Adams. This will be our first time performing in Seattle. We will be back there for Cues & Tattoos in the springtime too. Below are details for the upcoming goodies. July 27-29 (BOISE, ID): FUSION FEST – Boise’s Premier Fusion Belly Dance Festival Featuring Workshops by SOOZ, KAROLINA LUX, CALAMITY SAM & more. 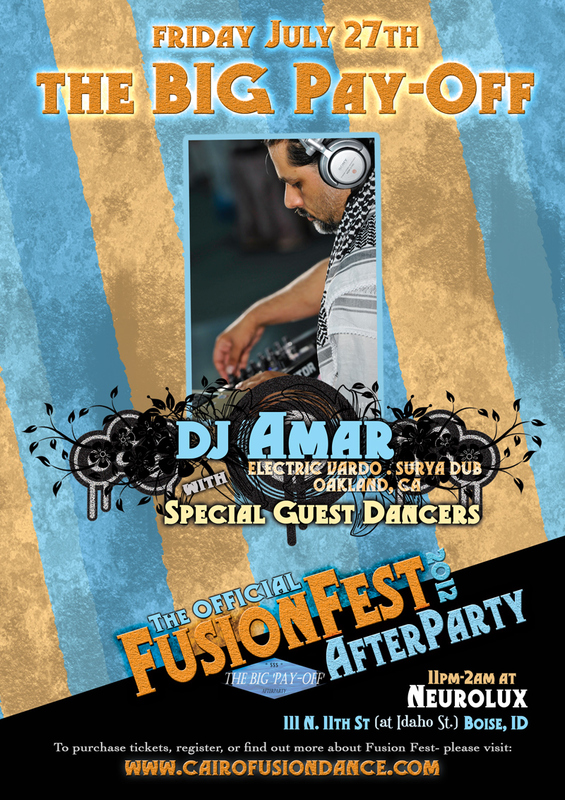 AfterParty Friday Night with DJ AMAR & Special Guest Dancers Presented by Cairo Fusion Dance. Saturday August 4 (Tacoma, WA): Cirque De Bijoux at The Dalton Club, 733 Commerce St. in Tacoma. Calamity Sam will be performing, Amar will be DJing after the performances. 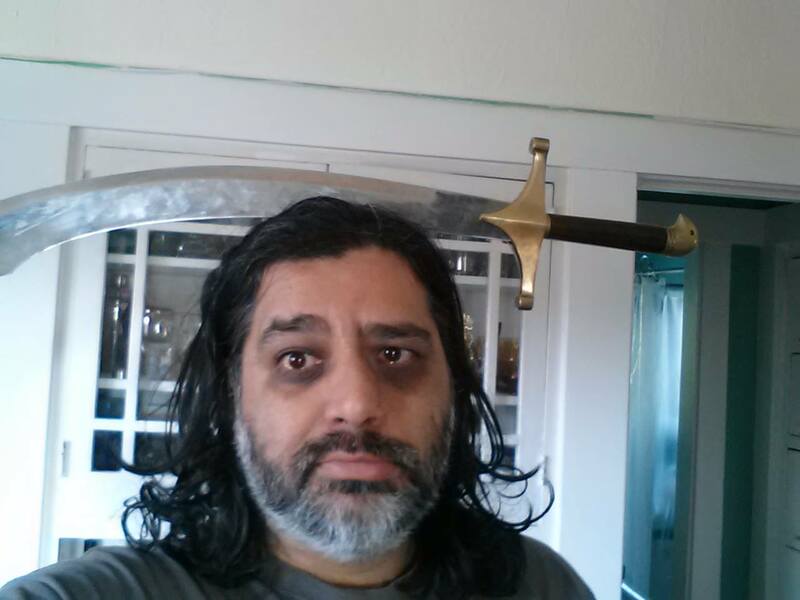 Details will be posted on Amar’s Facebook Page in a few days. 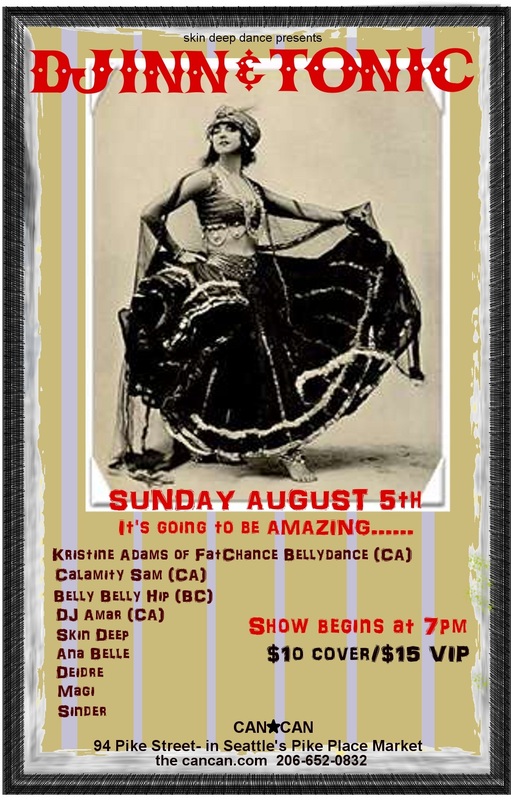 Sunday August 5 (Seattle, WA): DJINN & TONIC – Gypsy Dance Party featuring Kristine Adams (FCBD), Belly Belly Hip, Calamity Sam (CA), DJ Amar (CA), Skin Deep & more @ The Can Can (Pike Place). Kristine will be teaching in Seattle all weekend, hosted by Skin Deep Dance.